Joachim Claaus Fritz Berger was a German U-Boat sailor, who was captured in World War II and was a prisoner of war at the Wood Lane Prisoner of War Camp in Quorn. This photograph was donated by Bob Holland, whose grandparents, Clarence and Beatrice Holland, lived in Rothley Road, Mountsorrel. Clarence was very active in the Mountsorrel Branch of the British Legion, having lost an arm in World War I. This led him to support the camp at Quorn by having German Soldiers round for afternoon tea during their internment. They were all impeccably behaved, and Clarence and Beatrice became especially friendly with Joachim Berger. Bob's mother, Ethel Preston, married Clarence and Beatrice's son Robert William Holland. Ethel had a friend called Betty Lane, also from Mountsorrel, and Betty developed a friendship with Joachim. Joachim stayed on after the war, he settled in Mountsorrel and later married Betty at Mountsorrel Church. Ethel was bridesmaid, and continued to be friends with the Berger family. Joachim studied Music before the war, and after coming out of the prison camp, became a music teacher at Rawlins Upper School in Quorn. Bob particularly remembers the period 1970-1974 when Joachim taught music to his class. Joachim is buried in Mountsorrel Cemetery, a few yards from Bob Holland's father. He has a headstone that could be described as Teutonic. The photograph shows Joachim Berger and Betty Lane on their wedding day. 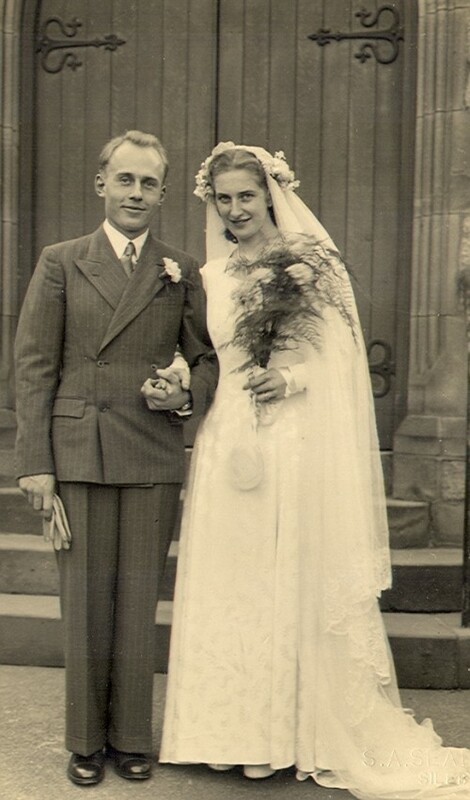 "We were married in the Wesleyan Methodist Chapel in Mountsorrel in October 1948. When in December 1948 Jochen, (as he was known), ceased to be a prisoner of war and he began working for my father in his building business, which he ran for some 10 years. During this time he also became a conductor of Sunday School choirs and of the Mountsorrel choral society. Eventually his love of music led him to qualify as a music teacher and he taught for nearly 2 years at a school in Ashby before moving to Rawlins. Rawlins was then a Grammar school for girls aged between 11 to 18, it had a good tradition of music which eventually included junior and senior choirs and orchestras, as well as instrumental groups of a very high standard. It seemed an appropriate move too, as I had been a Rawlins pupil during the years of the second world war - one of three generations of my family to study there. We made frequent visits to his parents in Germany for many years but it was only in 1994 that he finally re-visited his childhood home in Silesia, which after the war became part of Poland." Missing information: Do you have memories of any German or Italian prisoners of war from Quorn, or the Quorn POW camps? The team would love to hear from you.